Marketing internship in Gurgaon - From Netherlands to exploring Incredible India! Marketing internship in Gurgaon – From Netherlands to exploring Incredible India! 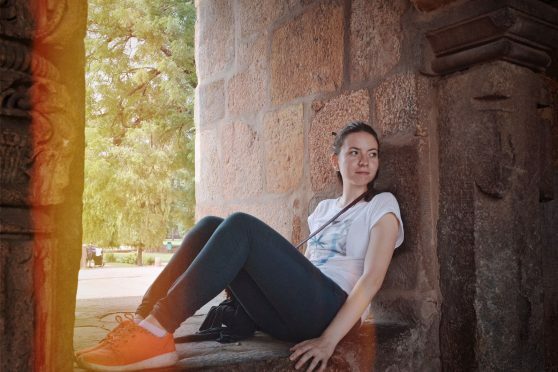 About the Author: Sofiya Popivanova, a student of Maastricht University, Netherlands, talks about her internship in India and how its rich culture and history intrigued her. This summer I had one of the greatest journeys of my life, a journey to remember! Starting from the Mughal empire, the rich ancient India, to landing in metropolitans, a completely modernized avatar of the country, I managed to explore different lifestyles, multifarious cuisine, and distinct climate and culture. However, what fascinated me the most was the work environment which was something I wouldn’t have been able to experience if I had only been a tourist. This academic year I decided to intern in a place I had never seen before. To fund my travel expenses, I started working as a part-time waitress in an Indian restaurant in Netherlands. Indian cuisine was a work of art – a colourful palette of spices. I made some Indian friends there and learned about their culture; I wondered why my boss had moved away from such a historically and culturally rich place. Soon enough, I started looking for internships; Asia and Latin America were my primary choices. While browsing through Google, I found a website named Internshala. ‘India, why not?’, I thought. After all, I had developed a close connection with the country in past few months. I followed the signs presented by my destiny and logged into it. Being interested in marketing, I applied for the internships that offered the opportunity for the same. I came across a post by a startup named Kiva in Gurgaon. I googled Gurgaon and found that it was close to Delhi. At that time, the only places I knew in India were Delhi and Mumbai and the only fact I knew was that chess and yoga originated in India. How I landed at Kiva? In mid-April, a Kiva representative emailed me regarding a Skype interview. Having applied for tens of companies, I had completely forgotten about Kiva and researched into it. The company profile interested me, and I decided to appear for the interview. I visited the company website and gathered its mission, visions, and products. I also looked into the LinkedIn profiles of the employees and the founder. In the interview, I was asked to present myself, my interests, and my academic background. After an initial introduction followed by my educational achievements, I told him that I was the co-founder and marketing coordinator of a student association. I added that I was organised, adaptable, and liked to unfold various cultures. I mentioned that I had managed to step strongly on my feet despite various financial and cultural difficulties. Then, I was asked why I wanted to come to India, why I wanted to join Kiva, how I could contribute to Kiva, and what I expected. I told him that I had been studying India’s political and economic development for past several years and believed that the country had a potential for success and economic growth. I mentioned that Gurgaon, being a startup hub, could offer me numerous career opportunities. As of my interest in joining Kiva, an organisation that manufactures ayurvedic drinks, I told him that I was passionate about healthy lifestyle, healthy food, and sports. Also, the organisation was offering a position in marketing and communication, something I was particularly interested in. Additionally, I told him that I hoped to learn multifarious skills such as hard work, teamwork, discipline, and keeping pace with working environment. I assured him that I could contribute to the organisation utilizing my marketing knowledge gained from university and my previous job at Ipsos. I added that I wished to learn Hindi as well. Finally, I enquired about the work hours, accommodation, and the required documents. A couple of days later, I received an email from the organisation citing my selection and confirming if I was willing to travel from Netherlands to India for a summer internship. After confirming my visit, I arranged for my visa and flew down to India, the land of diversity. Upon my arrival at Kiva, I had many questions. I was really curious to know how they came up with the concept. I was fascinated but overwhelmed with what I had read about the organisation. Ayurveda required a person to follow many rituals and details but a modified concept with a modern approach along with being affordable and easily accessible sounded great. On top of it, the concept was aligned with my vision for a healthy lifestyle in the 21st century. During my internship, I worked on search engine optimisation to improve the ranking of Kiva’s website using Google keywords and AdWords. I also helped in designing a new website for Kiva using Shopify. I researched the utility of visual merchandising for the organisation and how it could be positioned in physical stores in an attractive manner so as to increase sales. I also researched superfoods, aloe vera drinks, Kiva’s foreign competitors, and how Ayurveda was implemented abroad. I visited supermarkets with a colleague and poached the sellers of other companies. Apart from these, I handled email marketing, which involved emailing customers regarding feedbacks and updates on new product variants, and content marketing, which included writing blogs. I also observed the manufacture of the drinks and enquired about the financial domains. I enjoyed the lack of a hierarchical structure in the company. I was working in the same room as the founder, Shalabh, and didn’t have to pass through a secretary to communicate with him. I managed to attend many workshops on content marketing, social sales, and SEO in Gurgaon and Delhi. I also had the freedom to express my opinions on certain matters like product development. I enjoyed the simple things like having lunch together, eating Indians’ favorite food – maggie, and discussing Indian economy, politics, movies, and successful companies. We once went to a restaurant where I tried Rajasthani vegetable thali which was delicious but way too filling. Furthermore, not only did I achieve my dream to travel outside Europe but also my ambition to learn the art of writing quality blogs. I had never found the patience or time to write blogs before, but there I was inspired to write. I met new people; our team expanded and we moved to a new office. Morning routine, chai (tea), work, lunch time, work, chai, home or going for dinner with friends. I really felt like living a local’s life! Working with young people was a marvelous experience. Each day put forth a new adventure in India and even the cows, dogs, and horses roaming on streets were a new thing for me. I built a feeling that Indians live closer to nature though I found it dangerous. Travelling to work was particularly fun since I couldn’t speak Hindi and struggled to give directions to taxi drivers. During my stay in Gurgaon, I visited Sector 29, botanical garden, Cyber Hub, Kingdom of Dreams, and various malls. The metro services and Uber cabs were safe and convenient. Though I do admit that I didn’t feel very safe traveling alone in Gurgaon at night – some streets even lacked street lights! I travelled to Agra, Dharamshala, and Kasol with my friends besides Delhi, where I visited often. Apart from the beautiful memories that I created, there were some weird and funny moments as well. For instance, our office boy asked my boss if I was a cannibal since he had a notion that all foreigners ate humans! Beat that! P.S. Indian food is the most amazing cuisine ever; I ate as much as I could! Intrigued by the adventures Sofia had in India? Apply to these cool marketing internships and set out for your own adventures. A good story to get motivation . I also have just started a blog which is full of some good poems and articles which i think you will like . So plzz follow my blog and give any suggestions if required , it will be very helpful for me !! Thank you very much for sharing your experience to get motivate, it’s very useful article and hope to read more about your experience.